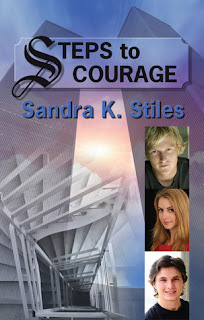 Steps to Courage is a fictional story based on a true event. This story is based on the horrors of nine-eleven when two planes crashed into the Twin Towers causing thousands of innocent people to die. The main characters of the story are Trina, Lucas, and Mark. Trina is a shy girl who was hurt severely in a car accident. Mark is a mysterious loner whose parents died in a fire. Lucas is a nice upper class guy who caused Trina's accident. The main part of the story is when three kids working for a fundraiser go into the Twin Towers on nine eleven and two big jets crashed into the Twin Towers , or World Trade Center. causing three thousand innocent people to die. Trina, Mark, and Lucas barely made it out with their lives. There was lots of bones, body parts, and debris everywhere, even in the air. Nine-eleven was on September eleventh, 2001, in New York City. My opinion of Steps to Courage is that it is a well detailed page turner and I couldn't stop reading it until I finished it. If you like to read interesting real life tragedies, then I strongly suggest reading Steps to Courage. This book interested me because my dad worked in the Twin Towers eight years before the towers collapsed. I also lived two miles from where the towers used to be.